I’ll have a selection of eyes, mouths, lips to choose from … for both men and women. At the end of the day, I’ll assemble the ‘ideal’ man and woman and do the big reveal. still adjusting to the peculiarities of a British Christmas. at the hint of a draft, to me it looks like foliage from a different planet. top, cognac infused . . . the list goes on! hit, it just ain’t for me. London winter to a wonderfully warming drink. Ah, Christmas . . . Customer Favourite. 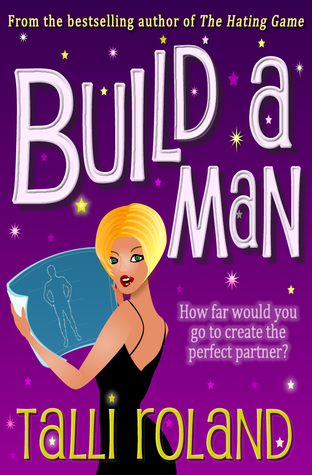 Build A Man is her latest release. Talli blogs here and can be found on Twitter here. Build a Man by Talli Roland on sale at Amazon or add to your Goodreads. Don’t forget to check out the party! LOL. I suppose the mince bit must be off-putting, Talli. Glynis, I can just picture you fighting someone over a turkey! Joanne, it is, isn't it? I love hearing about Christmas in other countries. Hee! I am also a committed anglophile. I dislike fruit cake. I think it tastes yucky. I love Tali's posts and this one is no exception! She has talent for making the ordinary fun. Her book will be on my list… right after your latest one, Sue! It took me years to figure out mince pies because my mom referred to ground beef and minced meat. So I thought for many years that mince pies had ground beef in them. Sad huh, considering I was from England. But what do you expect? Mom only made mince pies once a year. I wonder if Santa drives his sleigh on the left side of the sky in England. I wonder if it is possible to build the ideal man with Santa's help? Well, in things that I CAN do, I've yanked my kindle version of Build A Man already. YAY!!!! Lisa, it took me ages to get the 'pudding' thing straight, too. Very confusing. Cynthia, I do love it here. London is a great city to live in! Margo, thank you so much! Stina, I KNOW! The mince thing is so confusing. I thought they had mince beef in them, too. Blergh! Jen, ha! I haven't stayed up late enough to catch sight of Santa over here, but if I ever do, I'll let you know. Thanks again to Susan for hosting me! Thirty to sixty quid for a four-foot tree? London really is more expensive than the rest of the UK. We don't usually pay more than thirty, for a six-footer with plenty of branches. And if you use a stand that can be filled with water they keep there needles pretty well. @SuperHappy That comment is AWESOME! LOVE ACTUALLY is one of my favorite Christmas movies. Now I can get into the Brit Christmas spirit a little deeper. It's wonderful to see Christmas from another perspective. We're big on fruit cakes in Jamaica too – ours is dark and rich, both in terms of fruits and spices. Well done on Build a Man, Talli. Hi Susan and Talli .. Christmas in South Africa was the same as Christmas here – except it was desperately hot .. and we wilted – but we ate a full dinner/lunch – whatever time of day our meal was .. I used an aloe branch instead of Christmas tree at our house .. I love the traditions of Christmas – all the preparations and joining in etc .. great fun .. and I love Christmas cake – but only with proper home made icing and marzipan on first (also home made) – the bought stuff is yugh!